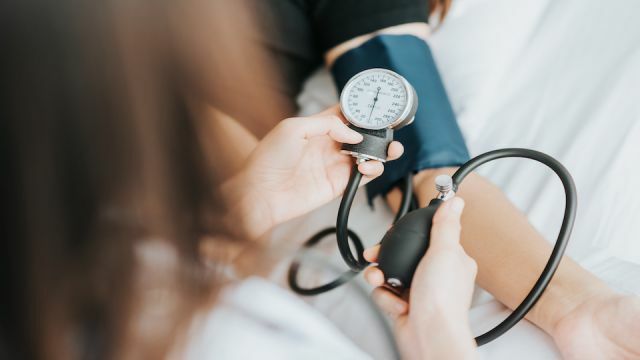 Known as the silent killer, high blood pressure impacts one in three adults It is imperative that you have your blood pressure checked on a regular basis and know where you stand to avoid future complications that can be deadly. To help avoid high blood pressure, here are 19 things you should be doing now. The first one is a delicious suggestion that will make everyone with a sweet tooth happy. Get your dark chocolate on: If you love dark chocolate, you are going to love this. Research shows that eating dark chocolate in moderation can keep blood pressure levels normal. This benefit comes from the protective flavonoids in dark chocolate. Studies suggest one regular size dark chocolate bar per day will do the trick! Yay!! Be sure to purchase high quality 70% plus cacao bars. Get to and stay at a healthy weight: Keeping your weight stable and knocking off extra pounds really goes a long way to keeping your blood pressure within the normal range. Even losing as little as five to ten pounds can make a tremendous positive difference in blood pressure and lower your risk of heart disease. Exercise: Not only will exercise help you keep your weight stable, but it also elevates your mood, builds lean muscle and protects your heart. If you have not been exercising at all, start with a brisk walk a few times a week and add to that some resistance training and stretching. Join a gym or take a class with a friend who will help keep you motivated. Eat fiber: Fiber helps us feel full for longer which also helps keep our weight where it needs to be. Excellent sources of fiber include dry peas, lentils, beans along with fruits and veggies with their skin left on. For excellent health, aim for 21-38 grams of fiber each day. Relax: Although this one may be tough for you, it is important not only for your physical health but also for your mental health to relax daily. Carve out some “me” time each day where you can be quiet, reflect and relax. Some people listen to quiet music, sit in nature or practice deep breathing to let down and release tension. Find your perfect way to relax and be consistent. Get plenty of sleep: Sleep is necessary for all bodily functions and not getting enough can contribute to high blood pressure. We live in a hectic culture and chances are that you often find yourself cutting your sleeping time short on either end. One of the best ways to ensure that you get plenty of sleep is to stick to the same waking and bedtime hours each day. Developing a habit of going to bed and getting up around the same time encourages your body to get into a healthy rhythm. Floss your teeth: As strange as this one may seem, research has found a link between poor dental hygiene, particularly lack of flossing and hypertension. If you want to take care of your heart, be sure to floss correctly once per day. Get out in the sunshine: Vitamin D, also known as the sunshine vitamin is integral to health. A study shows that not getting enough vitamin D can cause blood pressure to elevate. Try to spend at least an hour a day outside soaking up some sun and eat foods that will help elevate your levels like eggs, tuna, salmon and yogurt. Be sure to get your vitamin D tested regularly to assess where you are. Drink beet juice: According to one study, drinking a cup of beet juice can lower blood pressure in just a few hours. The study found that systolic pressure was lowered by an average of 4-5 points in those who drank the juice. This is because beets contain nitrates that are converted into nitric oxide that relaxes and dilates blood vessels leading to improved blood flow and lower pressure.